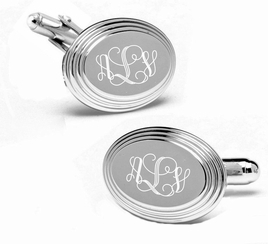 These silver beveled edge cufflinks can be personalized with a name, initials or date. These engraved cufflinks feature a swivel back closure system that will keep them securely attached to your cuffs. Our high quality cufflinks make great personalized wedding gifts for your groomsman and best man. All of our high quality cufflinks are precision laser engraved by our expert team of engravers with a very quick turnaround time.